Experts say coders can enhance their careers by becoming proficient in the finer points of the latest payment methodologies. The question of who is most qualified to perform clinical documentation improvement (CDI) often causes tension among coders and nurses alike. This tension has continued to grow as physicians and hospitals try to determine who is best equipped to help them make the transition to quality- and risk-adjusted payments. Should it be a coder, a nurse, or both? When attending regional and national coding conferences, Chandra Stephenson, CPC, CDEO, CIC, CRC, a senior associate in health industries at PricewaterhouseCoopers and an AAPC fellow, frequently overhears physician practice-based coders say they feel that nurses pose a threat to their jobs as practices make the shift toward risk-adjusted payment methodologies. At HEALTHCON 2017, AAPC's annual conference, one attendee voiced her own concern during a presentation about how emerging payment models will transform physician practices. She said physicians are starting to hire nurses rather than coders as they embark on the journey toward Medicare payment reform. Coders' fear of being pushed out of their traditional roles is not completely irrational, Stephenson says. "Risk adjustment is all about chronic disease management," she says, adding that nurses can more quickly and easily abstract specific information from patient charts to help support the identification of chronic illnesses. Even though nurses possess strong clinical knowledge, risk adjustment is fundamentally a coding concept, says Brian Boyce, BSHS, CPC, CPC-I, CRC, CTPRP, CEO of ionHealthcare and author of AAPC's Certified Risk Adjustment Coder (CRC) curriculum. "A coder who knows what they're doing in risk adjustment will be as important—if not more important—than a nurse. Nurses may be strong on the clinical side, but coders understand the coding rules and guidelines better than nurses ever will. I have a clinical nursing background myself, so I can attest to many scenarios where a certified coder's skills are truly needed and valuable." Susan Parker, owner of Seagate Consultants, an HIM recruiting company, agrees. "I think coders still have the edge because of their coding knowledge," she says. "This is clearly part of coding. A nurse will have to learn coding. You can't use a cheat sheet. You really need to understand it." Others believe that documentation improvement for quality and risk adjustment should be a joint effort in which nurses and coders work together to improve documentation and capture the coded data that are necessary for accurate payments. "While the nurses bring value, so do the coders," says Christi Roberts, RHIA, CCA, director of operations at Woodham HIM Solutions. "One shouldn't replace the other. They both have value. It's about developing that relationship between the two. If coders and nurses can learn to work collaboratively, then it's the best of both worlds." For example, capturing risk often requires process improvement to address clinical care gaps. Patients must be seen at least once a year so hierarchical condition categories (HCCs) can be evaluated, documented, and billed. Coders identify the conditions that matter most in a risk-adjusted payment model and nurses can reach out to patients with these diagnoses to ensure that they're seen. The same may be true on the hospital side. 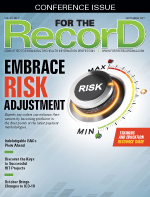 "A team of experienced clinical staff, excellent data analysts, and top-level coders is necessary to create, implement, and maintain an effective risk management and reporting process," says Judy Sturgeon, CCS, CCDS, clinical coding/reimbursement compliance manager at Harris Health System in Houston and a contributing editor at For The Record. This collaborative model exists at Harris Health System, where Sturgeon says coders and CDI specialists work together to examine annual payment reductions due to coded obstetrical hemorrhages, a Medicaid potentially preventable condition. This diagnosis has complex coding rules that can differ significantly from clinical definitions of hemorrhage, which is why input from nurses and coders is critical, she says. Still, many coders may not have a strong foundational understanding of risk adjustment to be successful in this somewhat specialized niche of coding. Risk-adjustment coding is all about how a patient's diagnoses potentially increase the cost of care, Boyce says. Diagnoses that have no effect in traditional reimbursement models may have a substantial impact in a risk-adjusted model, he explains. Boyce says coders who want to move into risk-adjustment coding must be willing to dive into various risk-adjustment hierarchies and methodologies to understand how they work. He suggests coders take a course on risk adjustment or pursue AAPC's CRC credential, which helps coders understand the impact of diagnosis coding on various risk adjustment payment models and teaches them how to identify and communicate documentation deficiencies. "They need to be willing to learn and continue their own education," Stephenson says. For example, coders must be prepared to increase their knowledge of physiology to better understand the clinical markers and risk factors of disease progression. Pharmacology courses are also important because they can help coders more easily identify the link between certain medications and conditions that might not be documented in the record. Stephenson suggests checking out Coursera, a website that includes thousands of free courses from leading institutions all over the world. "For coders, a serious course in pathophysiology makes a huge difference in helping them understand the clinical issues involved in the disease process both for improving coding and for improving documentation query forms so the forms make sense to clinical personnel," Sturgeon says. Attend risk adjustment-related sessions at national coding conferences, Parker says. Also consider requesting that a risk-adjustment expert speak at your local/regional conference, she adds. Communication skills are a must, Sturgeon says. "My recommendation would be for coders to get out from behind the computer and establish relationships with people in other departments who can benefit from their extensive knowledge of coding and data reporting," she says. This could include volunteering for workgroups and process improvement teams. "Find out who's handling the quality reviews, introduce yourself, and offer assistance should they ever have coding questions," Sturgeon says. "Be the friendly face for your CDI specialists when they need an explanation about a query concern." Respectful communication with physicians, nurses, and peers is important regardless of the payment methodology, Sturgeon says. A statement such as "Help me understand how you got this code. I may have missed an important piece of documentation in my review" is preferable to "You coded this wrong," she says. "The softer approach makes the review a collaborative effort instead of a perceived attack," Sturgeon says. A New Career Path for Physician Coders? Risk adjustment—the idea of paying more for sicker patients—is not a completely new concept. Diagnosis-related groups (DRGs) have been used in the United States since the early 1980s. In 2004, the Centers for Medicare & Medicaid Services (CMS) created HCCs to risk-adjust capitated payments for its Medicare Advantage (Part C) plans. This was three years before CMS refined DRGs to include complications and comorbidities, now known as Medicare severity DRGs. However, unlike Medicare severity DRGs, HCCs have remained largely in the background of health care payments until more recently when payers began to embrace population health. HCCs also play an important role in CMS alternative payment models such as shared-savings contracts and accountable care organizations. Essentially, HCCs allow payers to assess outcomes, predict costs, and gauge overall performance—three critical steps in the journey toward population health management. HCCs represent a significant departure from traditional fee-for-service payments—something that has begun to catch the attention of physicians. "The challenge right now is that those physicians who have not historically had a large population of Medicare Advantage payments are not as familiar with risk adjustment," Stephenson says. As physicians continue to enter capitated payment arrangements, they expect that any coder they hire will already possess this knowledge—or they assume they need to hire a nurse instead. Donna M. Smith, RHIA, senior consultant at 3M Health Information Systems, says the shift toward risk adjustment is an opportunity for coders to showcase their knowledge—particularly as hospitals and health systems purchase physician practices and begin to expand their CDI programs into the outpatient arena. Most HCC data are captured in the physician practice setting, providing coders with many opportunities to help physicians capture coded data more efficiently, she says. "In the inpatient setting, CDI nurses and coding staff work in collaboration to get the best information out in coded data, and I think they could do this collaboration in the outpatient arena as well," she says. A quick search for "risk adjustment coder" on the popular job website Monster.com reveals hundreds of these jobs nationwide. Many are posted by payers, health systems, and large physician groups. Parker says many job seekers with risk adjustment experience have already begun to contact her looking for placements, though she hasn't personally filled any positions. "That doesn't mean the industry isn't ready for them," she says, adding that those with experience in risk adjustment are typically qualified for positions in revenue integrity and auditing. "It just means employers may not be ready to hand that job over to a recruiter." There are many ways in which coders with knowledge of risk adjustment can make a difference—particularly in the physician practice setting. For example, Smith says coders can help physicians identify the coded data that have value in each payer-specific risk adjustment methodology (eg, CMS HCCs, Health & Human Services HCCs, and 3M Clinical Risk Groups). They also can perform documentation reviews prior to and following annual wellness visits to help physicians focus on HCC diagnoses that directly affect risk-adjusted payments, she says. According to Smith, physician education is paramount because in a fee-for-service model, physicians aren't accustomed to thinking about diagnosis coding and documentation. For example, coders can audit HCCs to help physicians understand areas where documentation may not support the assigned code. Guidance such as not choosing the first (and often unspecified) diagnosis code in an EHR drop-down menu can make a significant difference in risk adjustment, Smith says. The same is true for reporting as many as 12 diagnoses—particularly chronic conditions—on the electronic claims form. "The doctor knows that the patient has all of these conditions—and they're taking them into consideration when making recommendations for treatment—but they're just not putting them on the bill," Smith says. Boyce agrees that audits are important—not only to identify opportunities to add diagnoses to a patient's profile but also to identify any diagnoses that were added improperly, all with the goal of cleaning up the data to ensure their accuracy. Smith says many physicians fail to include a diabetes diagnosis on claims with evaluation/management codes despite the fact the diagnosis was on the patient's lab order. Lab codes are not included in risk calculations, meaning physicians miss out on reimbursement for treating this highly weighted condition, she explains. However, when coding for risk adjustment purposes, coders are allowed to manually pull diagnoses from other settings and include them, Boyce says. Help physicians make the connection between risk adjustment and payment, Stephenson says. "It's really all about how the insurance companies that are receiving federal dollars are paid. How much the insurance company gets paid then determines how much money it has to pay the physician," she says. Coders who are successful in the long run will be those who can demonstrate their worth in an increasingly value-based health care environment, Stephenson says. For example, coders who are familiar with the Merit-Based Incentive Payment System can help physicians identify the quality measures recommended for a particular specialty. "The more familiar coders are with those, the better they can help physicians identify the elements in the record to make sure they'll get payment from a quality perspective and not just from a risk adjustment perspective. Quality goes hand in hand with risk," Stephenson says. Focusing on coding compliance is always critical, Smith says, noting that doing so often yields accurate reimbursement in risk adjustment payment methodologies. "I always say that accurate and complete coding is the bottom line," she says. "If you accurately and completely code information about a case, you're going to get the most accurate HCC and risk adjustment." • Hierarchical condition categories (HCCs) are weighted groups of diagnoses that contribute to an overall risk adjustment factor (RAF) score for each patient. • HCCs are based on diagnoses reported (and coded) in the inpatient, outpatient, and physician practice settings. • To be counted, diagnoses that carry HCC value must be documented during at least one face-to-face encounter each calendar year. Monitoring, evaluation, assessment, and treatment are not required as long as the diagnosis is noted as current, says Brian Boyce, BSHS, CPC, CPC-I, CRC, CTPRP, CEO of ionHealthcare and author of AAPC's Certified Risk Adjustment Coder curriculum. • Claims submitted by skilled nursing facilities, hospices, home health agencies, labs, radiology centers, and durable medical equipment providers are not included in the HCC calculations. • RAF scores are based on the following information: each patient's disease complexity (as evidenced by HCCs), certain demographic factors, and the simultaneous presence of several conditions. The higher the RAF score, the greater the payment.